Oklahoma City gutters come in a variety of options - which will you choose? Seamless gutters are more durable because seams tend to weaken the gutter over time and can cause destructive and annoying water leaks a few years after installation. Seamless gutters are our recommendation when it comes to Oklahoma City guttering systems. Oklahoma City guttering projects generally use the "K" System or the 1/2 Round System. We install these gutters in two common sizes of 5" and 6". You can also choose between 26 different colors for your gutters; Oklahoma City customers can customize their system to get the look they want. "K" System Gutters can be copper or aluminum and should be made right at the job site if any gutter lengths are over twenty feet. This ensures that the lengths are the same on all the gutters— Curb Appeal crews use screws in aluminum gutter installation. Screws, unlike nails, do not pull out resulting in sagging gutters. Downspouts put together with stainless steel screws can be quickly and neatly taken apart for easy clog clearing. This 1/2 round look has a nice classic appeal to certain older houses and may be appropriate if there is no fascia board. However, the 1/2 Round System is not available in lengths longer than 20 feet for seamless gutters—Oklahoma City Curb Appeal crews can still do a very neat and attractive job of piecing the lengths together. Not sure who to call for new gutters? 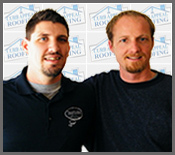 Oklahoma City Curb Appeal Roofing installs gutters Oklahoma City and surround town customers can depend on for years to come. Call today at 405-601-9222!